A program without bugs would be an absurdity, a nonesuch. If there were a program without any bugs then the world would cease to exist. Testing is complicated and I’m an engineer. […] So when engineers build something or answer a question about how to build things, we have to be sure we’re right. We have to be sure nothing is left out. It takes a lot of work. Interprets those as representing the lengths of the sides of a triangle. Prints a message that states whether the triangle is scalene, isosceles, or equilateral. This exercise in Binder’s TOOS was adapted from Myers’ The Art of Software Testing. If you are typical, you have done poorly on this test. Unit tests are a methodology for software development. ABAP unit tests are a mature framework in the developer toolbox. On one side a matter of focus: user acceptance testing validates the behavior that could be implemented in multiple systems. Integration testing can be seen as validation of the interaction of separate systems, e.g. a server (master data or SQL database) and a client system. When focusing on a single system, we validate the behavior seen by the end user. This usually requires process knowledge and should ideally not be performed by the original developer to reduce bias. The tester might understand system architecture, but details of the software implementation are typically seen as a black box. Integration or user acceptance tests could also be created using a Unit Testing framework, but other tools are better suited (e.g. eCATT). Unit testing on the other hand is white or gray box testing, where a good understanding of the system design is used to test modules in isolation. This is typically the developer using a unit testing framework. We concentrate on the Unit Tests that can only be created by developers and so must not be visible outside of the development phase in the Software Life Cycle management. The Continuous Integration approach has moved testing to central prominence, but this is not the scope of this discussion. So unit testing is something developers do. Or do not. 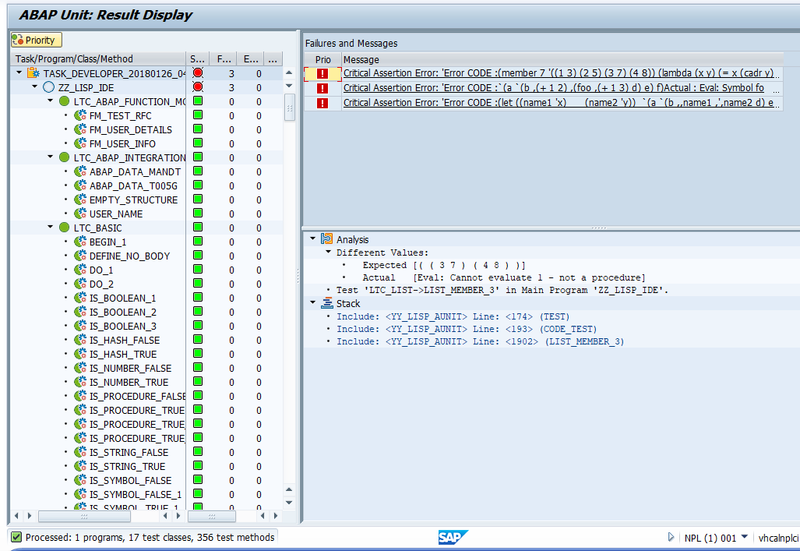 The ABAP Unit framework can be seen as alien in the ABAP workbench. It came relatively late attached to the late adoption of Object Oriented technologies with the marketing explanation of helping how to make more robust code via the testing of program routines in isolation. This did not yield a positive resonance in an environment where understanding the integration with the database is required even for smoke tests. Smoke test = start the application and check if it break down in flames. A special requirement in ABAP development is to understanding business rules and database tables well enough to create meaningful tests. SAP selling points are business processes, not development language. On the other hand, diversification of the tool chain is forcing an understanding and sometimes adoption of agile processes. The pragmatic ABAP developer will allow to be positively surprised by any new technology that pays for itself. I assume that most developer have given it a try and found it was not yet worth the trouble in this context. In the rest of this blog, I will try to manage expectation by presenting my opinion of the thought process required to invest in a test suite. I will discuss values and limits of unit testing in the ABAP context and present some refactoring use cases that are helped by ABAP unit. Writing unit tests is hard: no. Design is hard. Chance is, if your test is hard to write, then you are trying to test too much at a time because your design is not clean. Trying to write simpler unit tests force you to separate dependencies before writing the test. This is already a big change in your software. You should create test firsts then create the production code. While it is possible, this is hard. I have not seen it done properly in the ABAP context. This approach is called Growing Software guided by tests (cf. reference). You should have 100% code coverage. Why? Having tests in place do not guarantee there are no errors. They help identify areas of code with missing test. That is about the only quality measure. So Why Are You Unit Testing? I am testing to verify that my code perform exactly as I expect it. I do not expect to be surprised by the code or test behavior. I write test as a specification: to confirm that this module does what is expected when called with the defined parameters. In this optic, unit tests are an insurance policy for later, when I will be changing the code at refactoring time. The plan is not to find errors now. If I find an error, I will add a unit test to confirm that the behavior is as expected after the fix. This means that my strategy is to test after the code is implemented. There is a problem with test first, i.e. creating tests before the code is implemented: it requires a lot of discipline. It is a lot harder than you might think to just implement the minimum needed to make the test pass before doing the next step. And it might be impossible in an integrated environment with a large existing code base that has to be amended to satisfy a new required behavior. I do not expect every one to do it, but I surely think everyone can test last. The problem with test last is that beginner will spend a lot of effort trying to write integration tests, no unit test. Integration test are large and brittle, they break easily and must be corrected with small changes in the code base. They are difficult to support and are often abandoned because there is no benefit in constantly working on a test suite instead of fixing errors and refactoring the production code. Tests are validation to enhance our confidence in the behavior of the system. After running the tests and all test pass, we feel better. Actually, the benefit of the tests is a better feeling. We get back the Joy of Coding. Complex tests do nothing to enhance our confidence. Complex unit tests slow you down, they cost time to fix and at the end of the day, you won’t trust them because they fail often. The next developer will probably delete failing tests she won’t understand. If you stop trying to fix a failing test because you don’t understand it, you can delete it. Test will often fail because they are wrong. They can be wrong because of an error in the fixture (test data) or in the assumption you had while writing the test. If you want the test to survive the first failure, it should be easy to change. That is one reason to advocate test with a single assert. Testing will be repeated often, practically after each change. This only makes sense if the tests are automated and fast. So the main benefit of unit test I am painting here is in the automation of a lot of small even tiny tests that confirm the system behavior. The only reason to write bad unit tests is to learn how to write good unit test. If you know you are going to be working on this logic next year, save yourself some effort and invest in the code now by writing some unit test. So Do They Help At All? Those would typically be code parts where automatic testing is difficult. So we remember to test those parts manually after each change. If not, we then create new automated tests for a better coverage/understanding. RETURNING parameters cannot be used together with CHANGING or EXPORTING parameters on lower Netweaver releases. When I changed the RETURNING parameter (always passed by value) to CHANGING in one case, the system behavior changed: the variable passed as IMPORTING parameter with reference was initialized too early. To avoid this side-effect I changed the parameter to IMPORTING with VALUE( ) and the error was fixed. In the second down porting case, I was trying to replace the CONV i( ) statement with a helper variable, but I moved the assignment of the helper variable outside of a guard clause (TRY CATCH) and I did not notice it until the unit test failed. What is this worth? The code quality is not higher, but I have considerably reduced the testing time. My confidence is high. And once I trust the tests, I venture in deeper refactorings to make the code simpler without slowing down too much. That is actually the real risk: without automatic testing, the need for manual test makes testing for large software very expensive. But you know this already? My parser had failed to check for the closing parenthesis in an expression and I could not detect this via unit test because I did not write a test for this case. It was later as I was reusing the parser code that I found the error while trying to test for malformed expression. Tests helps to validate our code against our specification, they do nothing to ensure the specification is valid. When is it easy to do? It is easy when you have a good specification and/or a good separation of concern. Conversely it is hard to do unit testing when you design is changing too much, e.g. at the beginning of your project. You need more discipline to create tests in this phase. On the other hand, creating tests is a very useful introduction to a new code base. You verify your assumptions without risk for the production code. The tests are small, easy to write. If a test is difficult to write, it is abandoned. Once enough unit tests are implemented, you find it easy to move to a test first approach. I found I wanted to stop doing manual testing. I started writing tests before development of the production code to remember which features are on my log. CHECK ms_save_default_task IS NOT INITIAL. IF ls_default_task IS NOT INITIAL. CHECK is_default_task IS NOT INITIAL. I have to do a Where-Used check on method clear_default_task( ) to confirm the design decision does not conflict with existing code. LOOP AT lt_nodes ASSIGNING <ls_node>. lt_findstrings = VALUE #( ( <ls_node>-obj_name ) ). APPEND INITIAL LINE TO lt_nodes ASSIGNING <ls_node>. APPEND VALUE #( ) TO lt_nodes ASSIGNING <ls_node>. obj_type = <tadir_ddls>-object ) TO lt_nodes. lt_dependency = get_ddls_dependencies( <tadir_ddls>-obj_name ). from-obj_type = <ls_node>-obj_type ] ). ASSIGN COMPONENT lv_comp OF STRUCTURE ls_appr TO <ls_approver>. I do not recall requesting publication of blog but it was none of the less published by a moderator today. Note I will continue to update it as time permit. I hope you can still enjoy it. Mere words cannot describe how happy I am to see other people pushing this as a Good Thing. So few people use this (in ABAP world). I really like your examples on how to improve the code. We should have more of these to help others move on to more modern ABAP.